Valletta FC Futsal delivered an early statement of intent as they outclassed the University of Malta Students Futsal Team in the Super Cup, winning the curtain-raiser 13-1 on Friday. The champions were dominant throughout as they carried their fine form which earned them qualification to the UEFA Futsal Champions League Main Round into their opening match of the domestic futsal season. Led by coach Xavier Saliba, the Citizens took control from the outset with their players passing the ball around smoothly. The Universitarians struggled to cope with their opponents’ technical skills and were unable to react. By the end of the first half, Valletta were home and dry as they led 9-0 ahead through Camilo Andres Vanegas Gomez’s brace, Jovica Milijic’s hat-trick and more goals from Gia Nikvashvili, Dylan Musu and Shawn Vella. University goalkeeper Jonathan Martinelli was also unlucky as he scored an own goal. After the break, the Universitarians showed better ideas and looked more alert on the court. In the 30th minute, an own goal by Daniele Degennaro resulted in Valletta’s 10th goal. A minute later, the same Degennaro made up for this as he scored a UOM’s consolation goal following an assist by Daniel Borg. On 35 minutes, Dylan Musu scored his second goal to put Valletta 11-1 up. In the last minute, Denis Di Maio and Daniel Saliba also found the net to round up an impressive 13-1 win for Valletta. After the final whistle, the Valletta supporters joined in the celebrations after the team received the Super Cup from Louis Micallef, the Malta FA Deputy General Secretary. 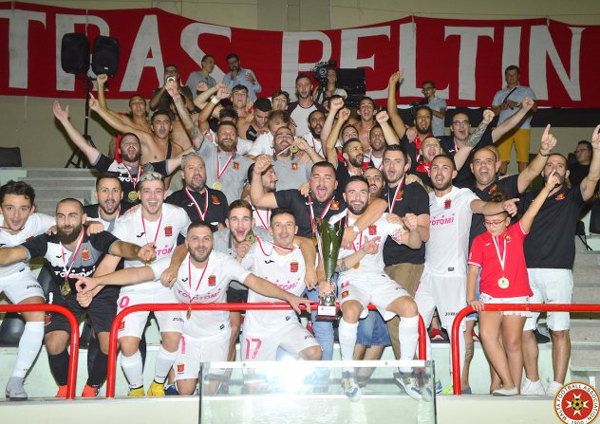 This was also a morale-booster for Valletta ahead of their commitments in the UEFA Futsal Champions League Main Round in the first week of October in Slovakia.